Joyce Heller has some great stories. Hired four years ago to teach math at Ma’ayanot Yeshiva High School for Girls, she learned that while students there had performed dramas, they had never done any musicals. “My first job was at an all-boys school, DeWitt Clinton in the Bronx,” she recalls, reflecting that while she started out teaching only boys, now she teaches only girls. 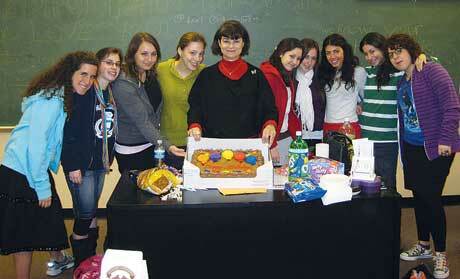 In between, she taught at Bergen Community College and Glen Rock High School, where she chaired the math department. The Fair Lawn resident – the 2003 recipient of the governor’s award for best teacher -has been an educator for some 36 years, spending the school year teaching math and the summers teaching drama. Among other subjects, Heller, a graduate of the High School of Performing Arts in New York City, has taught advanced calculus and statistics. Dubbed a “master teacher” – “When you have taught for a while, that’s what they call you,” she said – she has also written a statistics review book. Listening to her father, she spent 13 years directing productions at Camp Hillel in Monticello. Now, at Ma’ayanot, she is able to combine her two passions, serving as chair of the school’s math department as well as its musical director. “A musical is a wonderful outlet for girls to express themselves,” said Heller, who last year created the Ron Heller Award for outstanding graduating seniors, in memory of her late husband. “It’s like a scholarship for excellence in drama,” she said. Recipients each receive a trophy and $100, presented by the Ronald Heller Memorial Fund. “I should raise it to $136,” she joked, noting that her original intention was for girls to use the money to buy a good theater ticket. Heller is passionate about the importance of the theater arts. Rehearsals take place after school and during lunch. The musical director said, “Everyone who tries out gets some part,” if not acting, then operating lights and curtains – skills she teaches them. She is also involved in staging and choreography. According to Heller, math knowledge is helpful in producing plays. Recalling her days teaching drama at camp, Heller said, “For many Jewish kids, this was the first musical comedy they ever did. They didn’t even know how to stand on the stage.” She said that one camper wrote her a “beautiful letter” afterward, thanking her for the experience. “Teaching is a calling,” she said. “Whether teaching math or teaching drama, you work with the kids and see them grow. It’s tremendously gratifying.” She likened the role of a director to that of a teacher administering an exam. Heller noted that Ma’ayanot’s policy of excluding fathers from the audience – fathers can hug their actor/daughters before and after each performance but they must watch the show in another room, where it is simulcast – has been particularly helpful to her, as a widow.